Best Toys for 1 Year Old Boys! Best Christmas Toy Gift Ideas for 1 Year Old Boys! Are you looking for the best gifts for a 1 year old boy? It is your toddler boy’s first Christmas with the family! Or maybe it is his first birthday! Either way, birthday or Christmas, you want to find a very special toy for him, am I right? 1 year old boys are just learning how to walk and talk and they are very active and busy fellows! Educational toys are always a great idea, and also musical toys, light up toys and riding toys too, of course! *This cute and fun Power Wheels Thomas the Tank Engine ride-on toy is an awesome gift idea for 1 year old boys! They love being able to ‘drive’ their very own train and will be pleasantly surprised when they realize they don’t need to pedal or use their feet to make the train move! Grandparents love to buy this fun riding train for their grandchildren! I love choosing fun toys for toddlers! 1 year old boys are very active little fellows and they are eager to use those little legs, feet and hands! The best gift ideas for a 1 year old child are the ones that will make them use their body! No wonder they love riding toys! On this fun toys filled page you will find all of them, handpicked based on how happy parents are with them for their sons and on their quality! Smart Trike Safari: Awesome Gift Idea for a 1 Year Old Boy! A child’s first trike is a very special toy! It will be on lots and lots of pictures and videos for sure! These ‘Smart Trikes’ are great because mom or dad can push them, just like a stroller! Except it’s a fun tricycle! It looks like this little boy is having a blast! This cute Smart Trike will ‘grow’ with your toddler! Kids can use it from stroller to riding toy to scooter! It is the perfect gift idea for a 1 year old boy! Fun, colorful, useful and unique! Kettler Happy Navigator: Sturdy Trike for 1 Year Old Boys (and up)! This is the perfect first trike for a 1 year old boy because it’s not only super strong and durable, it actually will fit him until he is about 4 or 5 years old! This cute and colorful toddler trike is perfect for 1 year olds! It even has a seat belt and a way for parents to push them too when they get tired! Kids love when their parents take them for a ride around the block! Parents say that if you have more than one child this trike is perfect! ‘Big’ brothers and sisters love to take their little brothers or sisters for a spin! Overall this is definitely one of the best Christmas gift ideas for 1 year old boys! Most Fun Toy Gift Ideas for 1 Year Old Boys! Anything that will involve movement is a big hit! 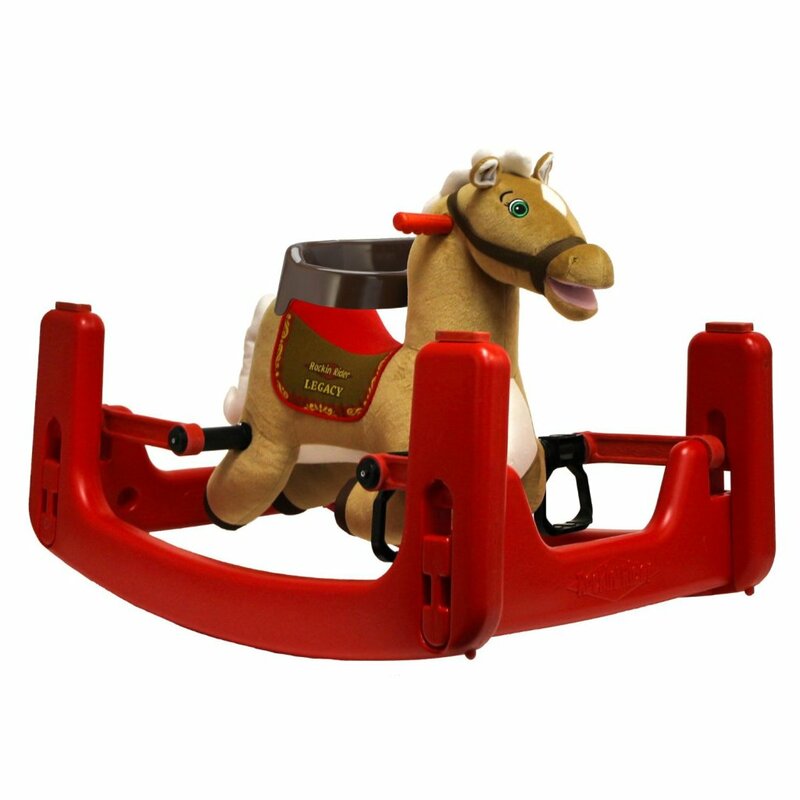 Small children absolutely love rocking horses and animals of all kinds, so you can’t go wrong by getting your one year old boy a fun rocking horse toy! This is a cute rocking pony that will have your 1 year old boy giggling all the time! Parents say it’s very sturdy and totally worth the price! The best feature is that it will ‘grow’ with your child! Another great feature is that it makes sounds and sings! When you press on his ears it will start singing “I’m a Little Pony” song and talking six phrases! Pushing toys and walkers are also great toy gift ideas for 1 year old children! 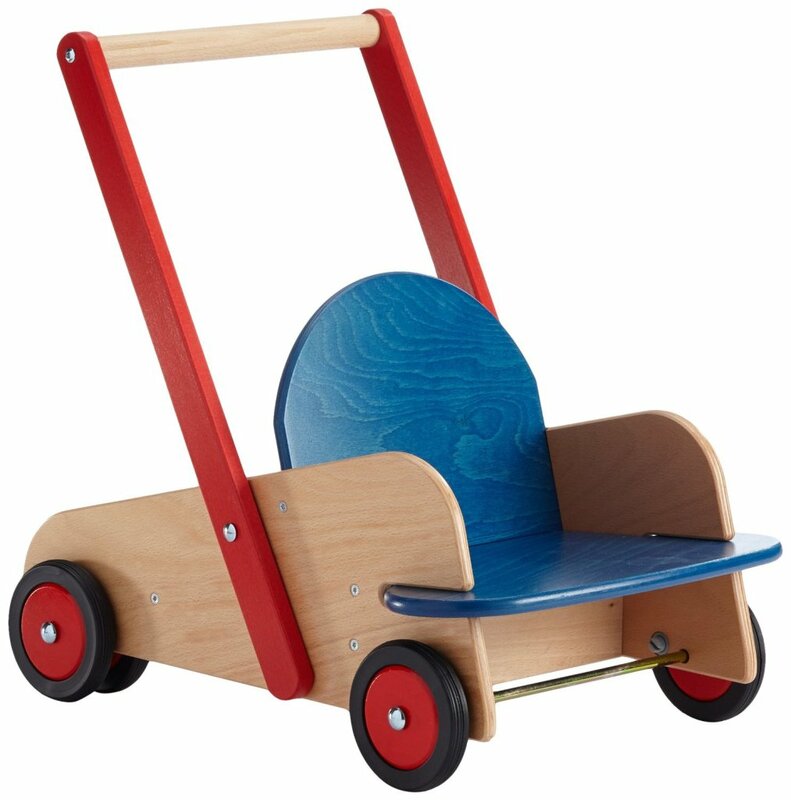 This fun pushing wagon is perfect for little ones between the ages of 9 months to about 3 years old! It will not only help them with their walking skills, but will also help them focus and keep their balance! It also fits lots of toys and stuffed animals inside, so your child can have fun carrying their toys from one place to another! Look who came to play! It is a cute giraffe walker! She is a fun wooden rocker that also moves her eyes! Parents say their kids love her and they use her everyday! The fun shape sorter is also a fabulous educational tool! Great birthday or Christmas gift idea for 1 year olds! You child is driving already! No need to wait until he is sixteen years old! Now kids can drive a car from he age of 1! This cute electric car for toddlers makes he perfect 1st birthday or Christmas gift idea for boys! This cute car will also make sounds in English or Spanish as your child drives! Fun Pedal Car for 1 Year Old Boys! A cute and fun pedal car is always a great gift idea for 1 year old boys! It is so much fun watching them learn how to use their car for the first time! Fun Educational Toy for 1 Year Olds! This is a very good educational toy for 1 year old children and even younger than that! Each side reveals something totally new for children to explore! They will learn animal names from A to Z and go through zigzag paths and fun routes while also spinning stuff and figuring things out! Haba Ball Track Roll ‘n Roll ‘n Roll: Fun Wooden Toy Idea for a 1 Year Old! 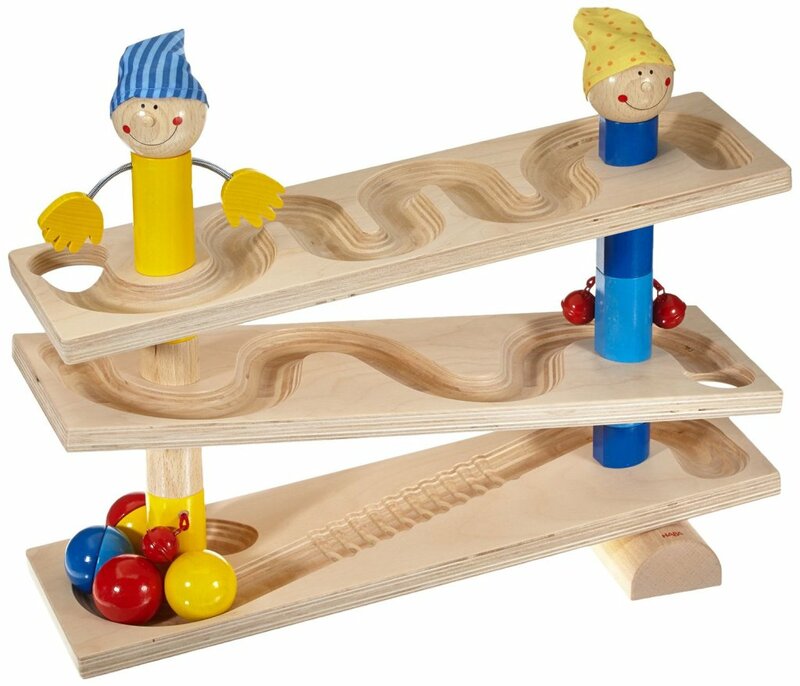 Looking for a fun and sturdy educational wooden toy idea for your 1 year old boy this Christmas? Try the Haba Ball Track Roll ‘n Roll! As the fun and bright colored balls go down the ramp, they touch the goblin dolls’ hands and bells! Fisher-Price Wheelies Loops ‘n Swoops Fun Amusement Park Toy! Your little one’s very first amusement park! They LOVE making the cute cars go through the 360 degree loop! It is one of the most fun toys for 1 and 2 year old boys around!! *Check it out! This little boy is having the time of his life demonstrating how this toy works! This is a very smart happy ‘teaching chair’ that activates songs and phrases when a toddler sits and stand! They love to figure out what all the cool buttons do! I love the cute, fun and colorful ‘magical’ book on one of the arms! This fun toy has so many fun activities that your little explorer will keep very, very busy! Now comes the best news for the parents and grandparents buying this fabulous toy for their 1 year old child: it is very affordable too! Best Gifts for 1 Year Old Girls!